First stop of the US-tour will be Cal Performances at UC Berkeley, where since 1999 we have been regular guests for the past 20 years. 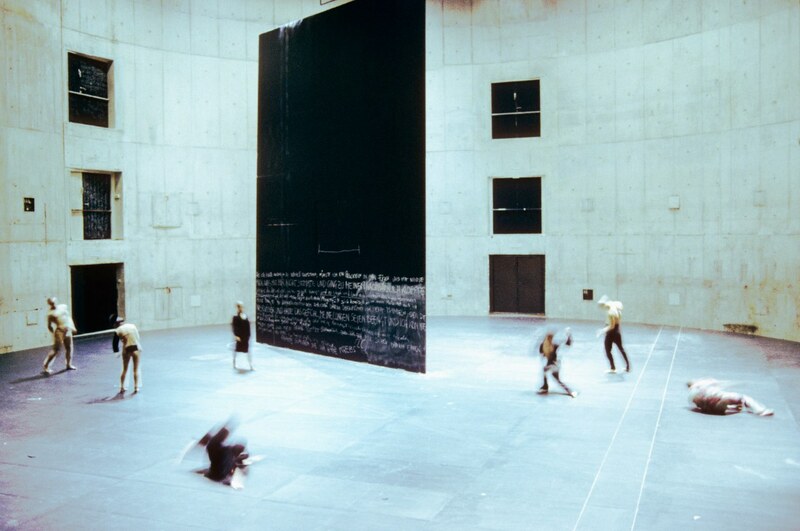 We are excited to be performing the piece »Körper« which has been touring world wide since its premiere at the Schaubühne am Lehniner Platz in Berlin in 2000, and which will celebrate it’s 200th performance while at Berkeley. Through a sober recognition of the body’s materiality, »Körper« tries to understand the fundamental split imposed on us by our physical nature. It interrogates cultural templates for movement, brutal forms of pleasure, enhanced performance and cosmetic improvement: the body regarded as a resource. Why do we treat our fragility with such severity? Why do our accounts of our own bodies always bypass what we actually feel? Twisting and turning the body, taking it down wrong paths, over and over again this choreography begins the work of a genuine making-visible. The body appears as something never before seen. On the 22nd October we travel on to LA, where we will celebrate the US premiere of the cinematographic version of Sasha Waltz’ choreography »Kreatur«, directed by Bettina Borgfeld and Jochen Sandig, at the historic Theatre at Ace Hotel in Downtown Los Angeles. The film is a co-production by Sasha Waltz & Guests and the ZDF in cooperation with ARTE. The film premiere and after party are the closing night event of the »12th Annual German Currents Film Festival«, a project of the Goethe-Institut Los Angeles. The event is co-presented by UCLA’s Center for the Art of Performance, presented in cooperation with the Goethe-Institut Los Angeles, and with the support of Villa Aurora & Thomas Mann House. From the west coast the tour then brings us all the way to the east coast, where we will present the US premiere of the choreography »Kreatur« by Sasha Waltz at the Brooklyn Academy of Music in New York as part of the 2018 Next Wave Festival from 2nd through 5th November. For »Kreatur« Sasha Waltz with her 14 dancers examines the phenomena of existence against the background of a disrupted society: power and a lack of power, dominance and weakness, freedom and control, community and isolation. Since its world premiere 2017 in Berlin the piece has toured nationally and internationally to Athens, the Festival d’Avignon, to Barcelona, Bruxelles, Dijon, the Tanzplattform 2018 in Essen, to Lisbon, and Rome. The US tour of Sasha Waltz & Guests is part of the Year of German-American Friendship 2018/19 – a comprehensive and collaborative initiative of the German Federal Foreign Office, the Goethe-Institut and with the support of the Federation of German Industries (BDI). »Körper« will be performed at the Haus der Berliner Festspiele on 6th through 9th December (ticket sale opens soon), »Kreatur« at the Radialsystem 19th through 22nd December (tickets available here). A production by Sasha Waltz & Guests in coproduction with Festspielhaus St. Pölten, Les Théatres de la Ville de Luxembourg and Opéra de Dijon. Made in Radialsystem.